If you are looking for the cutest little accessory for the upcoming season, Louis Vuitton has got you covered! Anyone who knows even a little bit about fashion has heard of Louis Vuitton — an iconic, luxurious brand that everyone admires. So if you still haven’t got any of their bags, it’s high time that you discovered how elegant, practical, and beautiful they are. Also, if you are a fan of medium- and small-sized bags, you will fall in love with this V Tote handbag in a matter of seconds. And if you prefer big and bulky bags, then it’s time to learn how practical and convenient smaller ones can be. There’s no need to carry a heavy load with yourself day after day; put just the essentials in your V Tote and enjoy your day! Apart from being so handy, this V Tote with an eye-catching red detail will attract everyone’s attention and make you the icon of style. Get it today and add some high fashion to your everyday looks. The V Tote BB by Louis Vuitton (10.6 x 7.5 x 4.3 in) features a big red triangular panel in grained leather in the center and the classic Monogram canvas. The gold-toned hardware adds a note of elegance and shine to the whole bag, and the leather name tag gives it an added dose of style. You can carry the V Tote either over the shoulder or as a handbag — the choice is entirely up to you. Louis Vuitton uses only the best materials for their products, and this handbag is no exception. 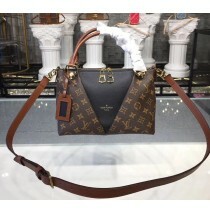 You can be sure of one thing — your Louis Vuitton handbag will not only make you look fashionable on all occasions, but it will also last for a long time. You will be able to wear it season after season, year after year. The Monogram coated canvas and cowhide exterior are both elegant and durable, as is the natural cowhide trim. Inside, there is a microfiber lining, a double smartphone pocket, and another flat pocket.